The Paris auto show is go and it's Renault with the most interesting tech so far in the form of its Android-based R-Link in-car tablet. It's the first time Google's Android OS has been used by a major car maker. We've known that R-Link was coming for some time, but now we can finally put some specification flesh on the basic Android-powered bones. According to Renault, R-Link will first be made available on the all-new Clio and the upcoming ZOE electric car and forms an integral part of the cabin centre console. The hardware involves a 7-inch touchscreen with a personalised home screen. 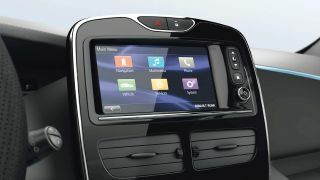 In that sense R-Link isn't really a tablet, as Renault claims. It's not a docked, removable device. It's a permanent fixture in the dashboard. By default, six core apps icons appear: Navigation, Multimedia, Phone, Vehicle, Services and Applications, and System. Of that little lot, nav could well be one area where R-Link offers a big step forward over existing in-car systems. That's because it's provided by TomTom and includes the full HD Traffic treatment. What's more the Coyote Series crowd sourced hazard warning service is also included, though sadly the latter is not available in the UK. If there's a big unknown with R-Link, it's the influence of Android on the user experience. Certainly, you can't just run standard smartphone or tablet apps on an in-car system. There are too many safety and reliability concerns in a motoring context. With that in mind, Renault is rolling out an R-Link store offering custom Android apps. Renault reckons the apps catalogue will cover everything from journey optimisation (TomTom LIVE services, fuel prices) and vehicle info to more practical help (phone numbers, Yellow Pages), comms (e-mails, R-Tweet app) and travel information. At launch, 20 apps are available for download from the R-Link store including Guides Michelin, Guide Marco Polo, Métro, Euronews, Elle Astro, Tourism Radio, Balumpa, Apila, I-Dispo. Sounds rather Euro-centric. New Clios and ZOEs will get four-strong introductory app pack: e-mail, Weather, Renault Assistance and Renault R-Link Tweet, plus the LIVE services associated with the TomTom and Coyote Series functions (depending on market). R-Link is fully independent and there's no need for a phone to use or download apps. Oh and R-Link also includes full voice control with a view to minimising driver distraction on the move. All exciting and innovative stuff. If R-Link succeeds, it could kick off a broader trend for Android-based and app-enabled in-car platforms. That said, it also presents plenty of questions. How many app developers will be willing to put time and money into apps for a single car manufacturer? Is there any scope for apps compatible with car from multiple brands? It's early days, but one thing is for sure. We can't wait to get our grubby paws on an R-Link enabled Renault. For our US readers, Renault currently has no plans to return to the USA. But with any luck R-Link may influence future in-car platforms from sister brand Nissan.